The Houston City Council confirmed the mayor’s appointment Wednesday. 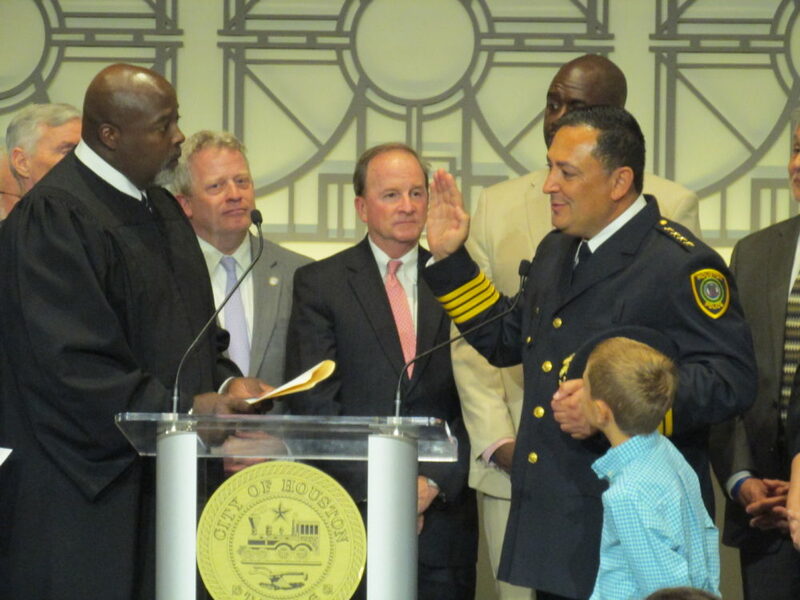 New Houston police Chief Art Acevedo takes the oath of office at City Hall Wednesday, Nov. 30. Houston Mayor Sylvester Turner took a break from the city council meeting to welcome Art Acevedo as the new chief, who took his oath in a brand new Houston police uniform in City Hall’s Legacy Room. Just a few hours earlier, the Houston City Council unanimously confirmed the mayor’s appointment – but not before some council members asked Acevedo some tough questions. Mike Knox wanted to know the chief’s position on open carry and campus carry. Acevedo said he testified against it in the state Legislature but that it’s now the law and he respects it. Council member Steve Le asked him how he feels about sanctuary cities, but the mayor jumped in before Acevedo could answer. The majority of council member comments were positive and full of praise for the former Austin police chief, who built a reputation of being big on community relations in the state’s capital. After the swearing-in ceremony, Acevedo said he can only be a good leader if his officers, as well as the community, know him well. Acevedo said even as chief he still went on patrol because he wants to stay close to an officer’s daily work. In the Houston Police Department, he wants to make the best use of resources. And one way to do that, he said, is to survey both officers and civilian staff to understand what their priorities and perceived challenges are. Acevedo is Houston’s first Latino police chief. The Cuban immigrant is fluent in Spanish. He takes over for Martha Montalvo, who served as interim chief after Charles McClelland retired last February. The Houston City Council also confirmed the mayor’s appointment of Samuel Peña as fire chief. He is expected to start in mid-December.